“White Azalea” is a stunning and professionally decorated 6 bedroom home with a private pool located in Seagrove Beach. Upon entering this home, you will fall in love with the chic coastal décor and family friendly layout. The open and spacious living, dining and kitchen area is filled with natural light and is perfect for entertaining and family gathering. The kitchen is well equipped with stainless steel Thermador appliances and a six burner gas range. There is also a separate ice maker for filling coolers and making tropical drinks! The living area features French style doors that overlook the pool and courtyard area. The private pool is a relaxing and offers a sun shelf for soaking up the sun. There is ample seating around the pool for family to gather after a fun filled day at the beach. The gas grill is perfect for cooking your fresh caught fish! The first floor master bedroom has a king size bed, flat screen tv and ensuite bathroom with a double vanity and glass shower. The large windows allow for natural light to flow in and offer a view of the pool area. The laundry room is located just off the kitchen with a full size front loading washing machine and dryer. For added convenience there is a half bathroom located off the hallway. Located on the second floor is 4 additional bedrooms and a bunk area. The second master bedroom offers a king size bed, flat screen tv and ensuite bathroom with a double vanity and glass shower. The guest king bedroom has a jack and jill bathroom with a single vanity and glass shower that also connects to the hallway (shares with built in bunks) and access to the shared balcony overlooking the pool. The two queen bedrooms each have a flat screen tv and share a connecting bathroom with a double vanity and walk-in shower. The built in bunk bed (two twins) have a flat screen tv and share the bathroom with the guest king bedroom. Just off the hallway is a balcony overlooking the pool and a second balcony overlooking Azalea Street. For added convenience there is a laundry closet with a stacked washing machine and dryer. The third floor is the ultimate kids area! The kids bedroom features two queen beds and two twin beds – perfect for all of the kids to be able to stay together! They also have their own mini kitchen with a full size fridge, microwave, sink and picnic style table– great for making late night snacks! The third floor bathroom features a double vanity area and a glass enclosed shower with a separate tub. 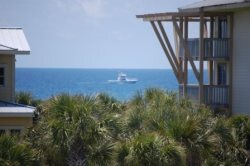 The fourth floor viewing tower offers beautiful views of the Gulf of Mexico and a relaxing area to unwind after your adventurous day on 30A. Make “White Azalea” your home away from home for your next vacay! 3) 6 bikes are included in the rental. To utilize, waiver must be signed and received before code provided. Please contact Saxon with Bikes 4U 30A at 850.399.1230 with any bike questions. The team at 30A Escapes is top notch. They were helpful and accommodating, answering all our questions. They were timely in answering text messages and emails and stopped by after we had checked in to make sure everything was as expected with the property. We loved it so much we want to come back! We cant say enough about 77 Azalea! As stated before, we have stayed in many, many properties in the surrounding area and this one is by far our favorite! Thank you for making us feel at home!